$49.95 In stock - low quantity. Order in the next 18 hours, 7 minutes and it will go out today! In stock - low quantity. Order in the next 18 hours, 7 minutes and it will go out today! What if your audience could see what you're thinking? Now they can with Wonder Imagery's Thought Bubbles. Someone makes a funny comment - the audience sees you thinking "LOL!" Someone takes a photo of you - everyone sees you thinking "I'm on Facebook!" You have someone pick a card - the audience SEES you thinking "3 of Hearts!" How is this possible? With Tim Sonefelt's pop-up signs, in the shape of a comic-strip thought bubble, you can make it happen. And you can do this over and over again as a running gag in your show. Check out the video at the top of this Amazekids page and you'll see a bunch of different applications for the family entertainer. These are great for use in publicity photos and have endless uses for your performances. Comes complete with the "LOL," "I'm on Facebook" and "Three of Hearts" thought bubbles. Plus, you get three blank ones to customize! Plus you get a DVD packed with ideas for ways to use these as well as instructions showing you how to customize the blanks. 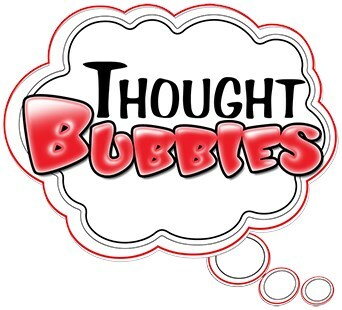 Thought Bubbles are based on an idea by Don Kincaid. Get a set and let the audience in on your thoughts, your onstage spectator's thoughts and all the humor that comes with this teriffic sight gag.